Should I Have Bodily Injury Liability Insurance? Home » Should I Have Bodily Injury Liability Insurance? While you might have heard of Bodily Injury Liability, many people are confused about what exactly this type of insurance includes. Bodily Injury Liability (or, BIL for short) protects a victim if you are responsible for causing an accident with serious injuries. The amount of compensation that BIL will pay accident victims is based on the limits of your policy. One of the most common questions that people ask is whether it is necessary to obtain this type of insurance. The answer is that there are several distinct advantages to having this kind of coverage. If you end up causing a motor vehicle accident, you should not hesitate to speak with an experienced accident attorney. Without Bodily Injury Liability, there is a risk that you can end up facing a lawsuit from the accident victim. Bodily Injury Liability makes sure that the accident victim receives adequate compensation for the various costs that can accrue after a car accident including medical bills, emotional suffering, and various other damages. Bodily injury liability can also pay for a lawyer as well as other costs associated with the legal process that might occur as the result of the accident. If you cause a motor vehicle accident and lack bodily injury liability, there is a risk that you might end up losing your assets. In situations in which a person has adequate bodily injury liability, however, it is unlikely that you will end up losing your assets. Motorists who purchase Bodily Injury Liability insurance are also able to obtain uninsured or under-insured motorist coverage, which is valuable because it protects you and your loved ones when car accidents occur due to the negligence of another driver. Does New Jersey Require Bodily Injury Liability? Motor vehicle operators in New Jersey are not required to carry Bodily Injury Liability. The Automobile Insurance Cost Reduction Act made sure that drivers throughout the state of New Jersey have access to a basic motor vehicle insurance policy. Many drivers in New Jersey, however, seek additional insurance protection beyond the basic policy to provide an extra level of protection in case an accident occurs. Bodily Injury Liability often has two limits. The first listed limit often determines how much a policy will compensate any one individual’s injury claim while the second amount is the most that a policy will pay for all of the injuries that occur as a result of an accident. 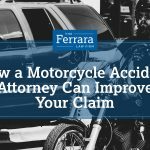 At Ferrara Law, we understand just how serious motor vehicle accidents can be as well as the complications that commonly occur as a result. 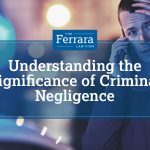 If you were involved in a car accident, you should not hesitate to obtain the assistance of an experienced accident attorney. Contact our law office today to obtain the assistance of an experienced and compassionate accident lawyer who will remain committed to obtaining the compensation that you deserve.